Imagine, an immigrant story, a war story, a love story, and a true story all rolled into one. That is what you'll find, and much more in Marianne Aleck's, non-fiction tale, The Liberty Club. This layered family memoir follows the lives of a Greek and a French family through their true life adventures that the author coined, "A slice of Americana with a European twist." ​Beginning at the turn of the 20th century the story embarks as the Greeks immigrate to America through Ellis Island, settling in Oroville, a northern California town that sprouted from the Gold Rush. You'll learn of their struggles and ingenuity, and how the Greeks adapted in America, while still preserving their rich European traditions. Timeless stories of life during the Great Depression are told through the eyes of youngsters, while alternately the French side shows a completely different mood, and lifestyle during the same era. Arranged marriages were the norm of the times, and how they played out was anyone's guess. The split narrative adds to the pace and mystery of their tales, finding both families affected in much different ways by the onset of WWII. The two bloodlines come together during the war, with a torrid romance between the Greek-American born soldier and his French beauty complicated, by Hitler's Panzers. Vividly portrayed accounts of famous battles, such as Anzio, and the Battle of the Bulge, from a soldiers perspective, and life endured under German occupation are palpable through first hand accounts. All this, and you're only halfway through this riveting tale. With close to two hundred pictures and images filling the pages from beginning to end, the characters, places, and events come to life. The Liberty Club is a state of mind, an inner drive, and a place in time. Within each player a story is born, sacrifices are made, love is found, and love is lost. What compels the true life characters throughout these pages? What drives them to their choices, and ultimate consequences? And what inspired the narrator to research and write for almost four years uncovering every scrap, every morsel about the lives of her ancestors? The answer to the latter; an undying curiosity, deep familial love, and nostalgia for a by-gone era of those who lived before us. Those, who lived to become known as The Greatest Generation. 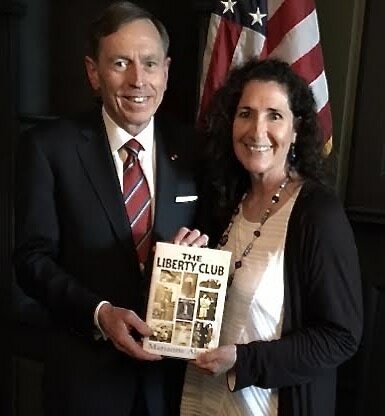 The Liberty Club is author, Marianne Aleck's tribute to a generation who unwittingly set a high bar for the rest of us to strive for, while holding her families amazing journeys, gently between pages. Click on View to take you to pictures of the YBC Charity Dinner. Check out Marianne's Radio Interview on Nancy's Bookshelf!